Rock climbing can scare the bejesus out of the best athletes in the world. It’s a risky sport where climbers choose their level of risk depending on the routes they ascend. Climbers long ago set a standard by establishing the hardest routes possible. The boldest routes, with the least amount of protection, received the highest praise. Climbers in the past didn’t even want to put up routes considered “easier” because they’d be shamed by their buddies, rather than receive high-fives. 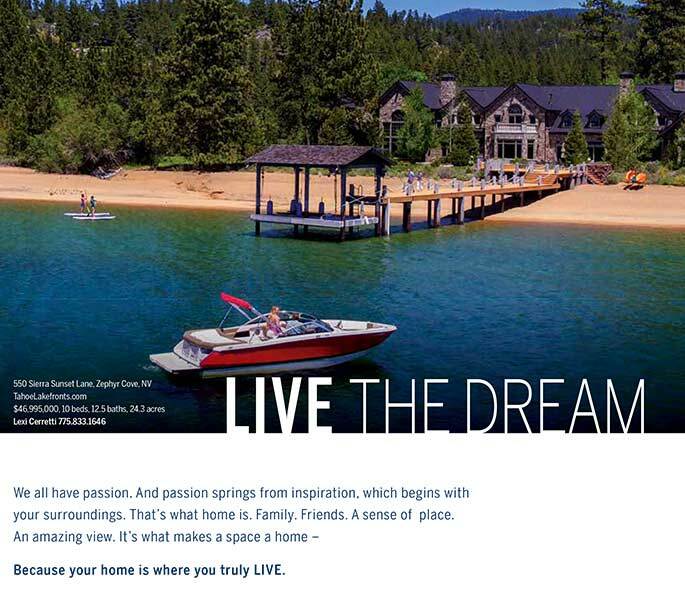 But a shift has taken place — and new development around the Tahoe Basin reflects that change. For those who want to climb 20 feet or more above the last piece of protection while searching for the next cam placement or bolt to clip, those routes are out there. 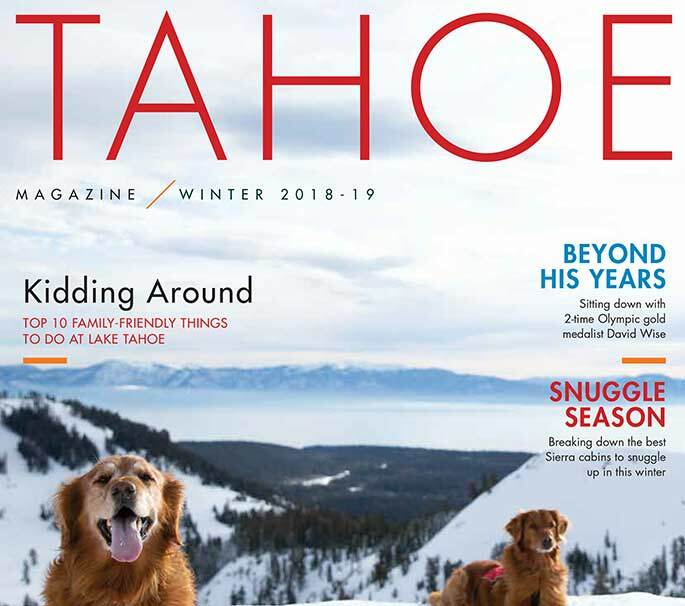 But new routes developed over the past few years in the Meyers and Castle Rock areas near the South Shore provide easier options for families looking to enjoy Tahoe’s natural outdoor gifts. South Lake Tahoe adventure extraordinaires Todd Offenbacher and Chris McNamara have climbed and established plenty of difficult routes. The two met on El Capitan in Yosemite National Park about 20 years ago. They ran into each other about 400 feet up a big wall climb and have been friends ever since. Upon establishing hard climbs, feedback was sparse, the duo admits. It was an empty feeling. But then the two teamed to make a first ascent of a route called Divided Sky in Meyers in 2016. 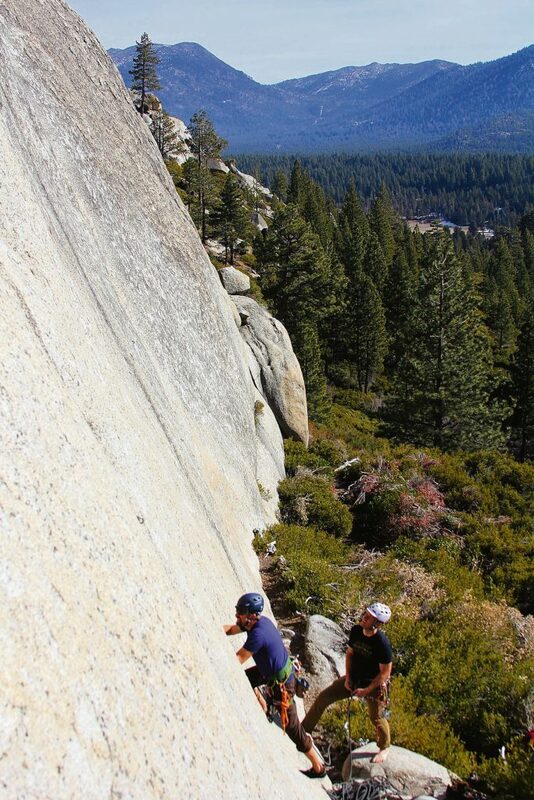 It is a moderate multi-pitch climb that has become popular. “It was great. After all the harder routes I put and didn’t hear a thing, so many people, especially people taking their kids on it for the first time, told me how much they liked it,” said McNamara, a guidebook author and business owner who has done all sorts of outdoor activities other than climbing, including mountain biking, motocross and BASE jumping. 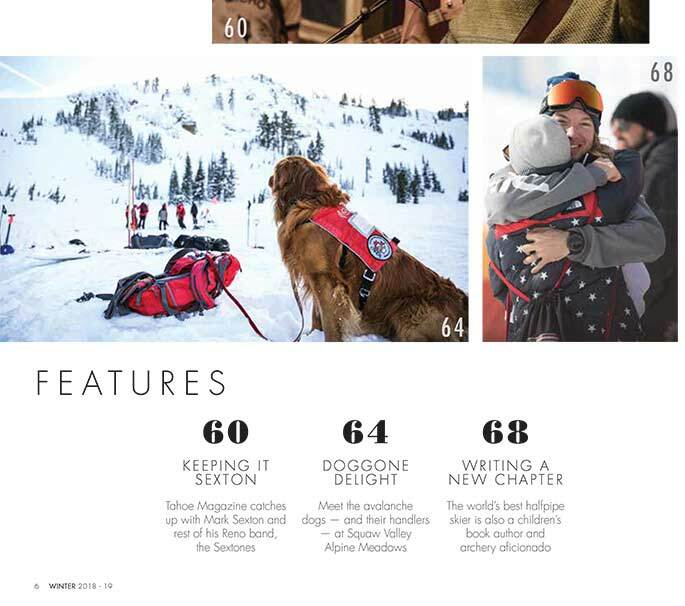 Offenbacher, 55, took his wife and 3-year-old daughter a few years ago to Chamonix-Mont Blanc, France, and was inspired. There were climbs of all grades. Families were outdoors together enjoying the recreation. Offenbacher brought that inspiration back to Tahoe and set his sights on Castle Rock, where he established dozens of easy to moderate climbs to go with harder routes already established. The rumor about Castle Rock before the new development was that the rock was no good, McNamara recalled. “It’s really good. It makes Joshua Tree look horrible, like loose sandpaper,” McNamara, 39, said. “In skiing, it’s who’s getting the biggest air. In climbing it’s who’s doing the raddest stuff. For me, it’s getting kudos from my friends and people I don’t know for doing these routes. It’s with community collaboration in mind that South Lake Tahoe residents Gantt Miller and Michael Habicht have been putting in a lot of work in the Pie Shop climbing area in Meyers off Sawmill Road. The pair have been stewards of the area and established several climbs in 2016 on what they called the Middle-Aged Wall. They’re still looking for more first ascents, and they’re also replacing old hardware on climbs established 40 to 50 years ago by legends of the sport. Miller went to Jay Sell, manager of South Shore sporting goods store Tahoe Sports LTD and part of Tahoe’s climbing royalty, before he started drilling holes in the rock. 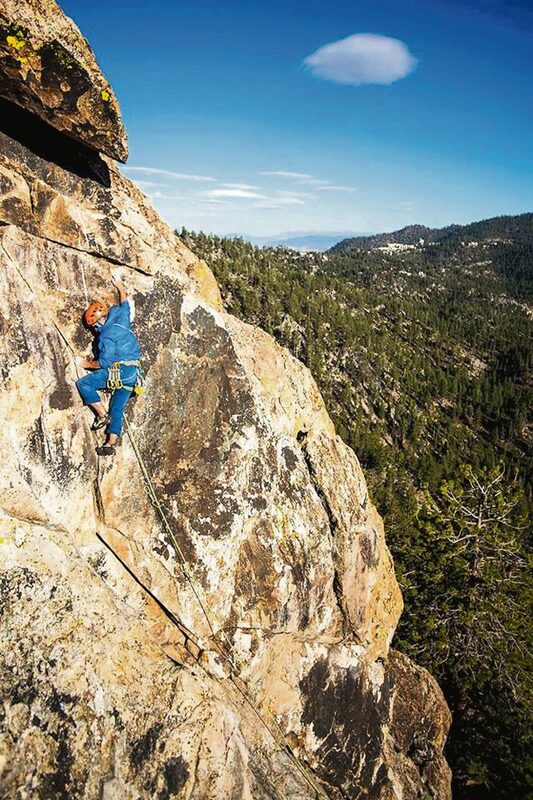 He wanted to make sure he was keeping with local ethics and didn’t want to disturb the legacies of legends like Dan Osman, the revered Tahoe rock climber, free solo climber and rope jumper who was instrumental in development of the Cave Rock climbing area. Osman, at age 35, died in November 1998 after his rope failed while performing a “controlled free-fall” jump, according to Outside Magazine, from the Leaning Tower rock formation in Yosemite National Park. Spending time hanging in space while drilling holes in hard rock takes a ton of time and motivation. Trying to place the minimum amount of bolts — a bolt is a permanent stainless steel anchor fixed into a drilled hole as a form of protection — takes the least amount of work. The more bolts, however, the longer the process. “It’s really cool to have this new vision and go out and do it,” said Offenbacher, who is still looking for more difficult first ascents. “It takes a lot of energy and a lot of work, with help from a lot of people. On the web: Visit mountainproject.com for more information on new rock climbing development around Lake Tahoe, like Castle Rock and the Meyers area, as well as the popular Donner Summit area and more. 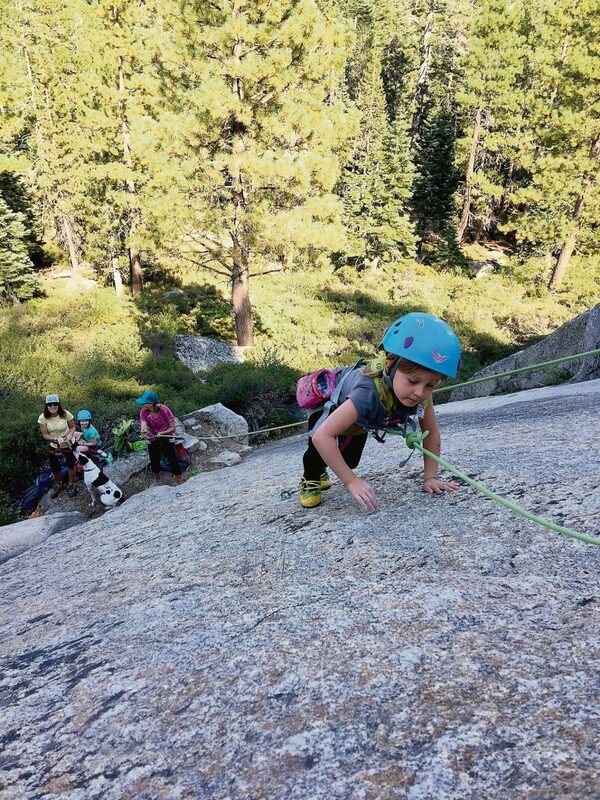 In print: Climbing guidebooks for Lake Tahoe include “North Tahoe: A Rock Climber’s Guide” authored by Josh Horniak in 2017, and “SuperTopo’s South Lake Tahoe Climbing,” published by Chris McNamara.